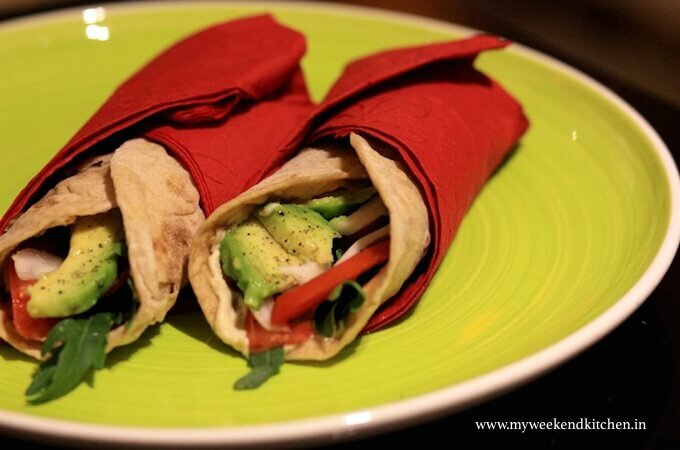 These avocado salad wraps are healthy, quick to make and easy “to go” foods. It is also a great recipe to redress leftover chapatis/ paranthas. Yesterday a friend of mine dropped in and we decided to carry a quick picnic lunch to the beach. I had some chapatis left from dinner last night and also home made hummus that my neighbour had shared with me. In just about 10 minutes we had our picnic lunch all ready and packed to go. Since they are cold, they make great lunch box menu too. 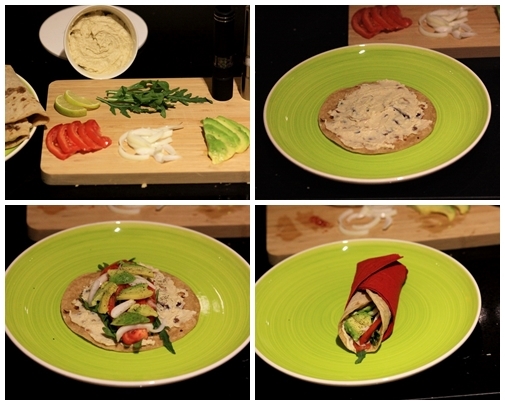 Here’s a quick 4-step avocado salad wrap! Core avocado and slice it. The avocado should be ripe but still firm. Slice the tomato and onions as well. Preferably keep all of similar size. Take one chapati/ tortilla and spread 2tbsp hummus on top. Load it with rocket leaves, tomato, onion and avocado slices. Season with salt and pepper. Drizzle some lemon juice on top. Roll the chapatti and cover in a napkin for easy hold. Repeat with other chapatis/ tortillas. Your avocado lunch wraps are good to go. note: If you want them warm, you can also toast the wraps in a sandwich maker. Add a slice of cheese, so that when the cheese melts it glues it all together.